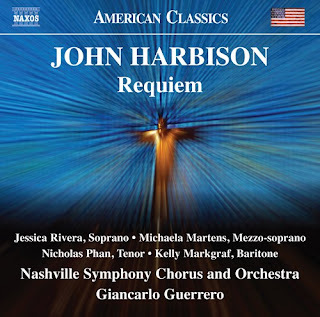 John Harbison (b.1938), most everyone will know, was one of the prominent American composers of the last "unchallenged" wave of High Modernism. I mean that he was more or less the last group of High Modernists who came onto the scene when that style of music was ascendant and unquestioned as the stylistically dominant force. Today of course we live in a time of pluralistic proliferation, where no one style commands contemporary authority. 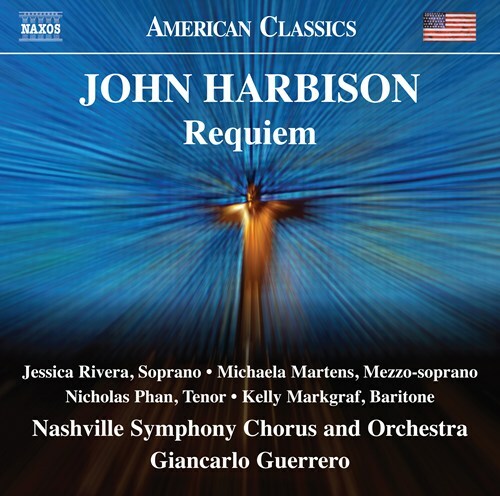 The current music by Harbison as we experience it in the recent release of his Requiem (Naxos 8.559841) has something of the old High Modernist roots to it but also a kind of chromatic Tonal dramatic Quasi-Romantic emotive Expressiveness to it. It is meant as a work that takes into account some of the tumult of the times, notably the world as we experience it from 9-11 on. And the Requiem Latin tradition contrapuntally and otherwise can be detected as a thorough flavoring of the whole. So it is a most ambitious work. After five hearings it does not jump out at me. It is very well written. The chorus and orchestra are commanding, though every singer has it seems a bit more vibrato than I would like to hear in this sort of Modernity, both the choir and the soloists. And so that is a matter of personal taste I suppose. There are moments here that sound a little closer to Berlioz than Mozart, and I suppose that fits with the wide arc of contemporary events of a tragic sort that the music no doubt reflects. Harbison began thinking of the work in 1965, and off-and-on composed parts of it until 2001, when a commission from the Boston Symphony Orchestra allowed him to cull together the pieces of the work and seriously realize the actual shape of the music as we now know it. The text incorporates the Latin Mass, plus some other material, such as an old Medieval poem with an archaic quality. He took all that he had thought of over the years and set out in earnest to flesh out the entire work as a full presence from September 2001 to March 2002. Of course this was the time of 9-11 and its aftermath. But too Harbison over the 15 years of its initial gestation had added names of people that touched his life and had died during that period, so it is a feeling of personal loss that guided his musical thrust as much as collective feelings of loss coming out of his time frame of final completion and reworking. So we hear the work today, as it took final form in March of 2002. There is some close to an hour of performance time, and it is is in two parts. Soloists, chorus and orchestra interact thoroughly throughout. As I am working though my sixth listen while writing this, I hear the notes and appreciate the inventive choices the composer has made. And the orchestra sounds quite appropriate. The soloists and chorus are suitably dramatic. So what is wrong? It all comes across as a work of a very moving sort. But I feel vaguely unsatisfied. That does not mean I am somehow objectively infallible! I've listened, for example. to Beethoven's "Missa solemnis" very many times and somehow it has alluded me, it has never quite clicked with me as opposed to most all of his other works. I find myself wondering if the same is not going to be the case with Harbison's "Requiem?" In each case I recognize that there is some great music here. And with the Harbison it is possible that I would take to it in another reading? I cannot say. I will not say I do not recommend this CD. Anyone who likes Harbison should hear this and decide for self. It is substantial. It is a monument or a memory stone of the times. I am glad to have it. I may end up liking it a lot. I cannot say that now. There are some thrilling passages. And some things do not quite get to me yet. It does not seem to grab me all that much. C'est la vie.